Then, in 1853, French surgeon Antonin Desormeaux coined the term ‘endoscope’, demonstrating an instrument that improved on Bozzini’s model by using a gasogene mixture to generate more transparent light than regular candlelight. Medical technology has increased in sophistication over the years; now there are capsule endoscopes, such as CapsoVision’s CapsoCam Plus device, that a patient swallows to get images of their insides. The CapsoCam Plus endoscope contains four cameras to give 360° panoramic lateral imaging of the small bowel. 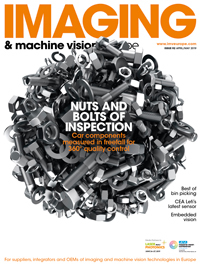 Size is a critical factor in developments in endoscopy, for obvious reasons, and so innovations in imaging technology are crucial to this market. Toshiba Imaging is one supplier of endoscope cameras; its 1.6mm diameter camera system includes an ultra-small CMOS sensor with 400 x 400-pixel resolution, 120-degree field of view lens, and an integrated LED. Meanwhile, OmniVision Technologies recently released its OH01A HD image sensor designed for endoscopes and catheters. It has a stacked-die architecture to keep it small, offering 1,280 x 800 resolution at 60 frames per second in a 2.5 x 1.5mm package. Shrinking the sensor, optics and lighting into a very small package creates its own set of challenges, as researchers at Johns Hopkins University discovered earlier this year. The team developed two endoscopic probes, one of which shrank the capabilities of a benchtop two-photon microscope into a device around 2mm in diameter. The second device is an optical coherence tomography (OCT) probe 500µm in diameter. The instruments are able to image fine tissue structures and cell activity in small organs in sheep, rats and mice. If clinical trials prove successful in supporting the instruments’ value in humans, it is hoped that this technology could ultimately help to reduce the need for invasive biopsies. Two-photon microscopy uses cells’ native ability to glow without the use of injected dyes to gather information. The advantage is that the chemicals traditionally used to label biopsy samples in a lab could be harmful if used directly inside the human body. ‘We couldn’t simply shrink a microscope that has dozens of distinct bulky parts,’ explained Li, ‘so we started a new design from scratch.’ A short-pulsed laser was used to create bursts of photons and transmit them down a specially designed, flexible fibre optic cable connected to the probe. They then travelled through a miniature lens, which also functions to refocus the light emitted by the cells and send it back to detectors through the same cable. The team designed the probe to capture 3D images by incorporating a very small scanner. The lens was carefully fashioned to focus the long-wavelength light emitted from the laser, while also collecting the short-wavelength fluorescence light emitted from the cells; the fibre optic cord, too, was bespoke to transmit both the excitation and fluorescence light, while minimising the background noise generated in the fibre optic cable. The second probe developed by the team was an ultra-thin OCT probe, which the researchers said allowed them to gain three to four times higher resolution when compared to similar technologies in clinical use today. ‘To achieve this,’ said Li, ‘we had to use a light source with a broader spectrum of colour, and the challenge was to focus all those colours onto a single spot without making the image look fuzzy. Cameras do this by using a large lens, but we did not have that luxury.’ The probe’s size was reduced by about half that of those currently in use, to about 500µm in diameter. Li and his team simplified the design by forming the end of the fibre optic cord into a tiny ball lens made out of silica, which was able to work as well as its larger counterpart. The ball lens is then ground and coated with gold to reflect and focus the light onto the tissue. The small probe had the additional benefit of improved flexibility, allowing the researchers to access and image small lumens in complex organs in animals with much clearer visualisation on tissue structures. The ultimate aim is for this kind of technology to be more readily available and at a realistic price point, as Li explained. ‘Ultimately,’ he said, ‘we want to be able to get images good enough so that we don’t have to remove tissue from the patient.’ The research team are hopeful that they will soon be able to begin clinical trials for their OCT and two-photon probes to establish their viability for use in humans in terms of safety and effectiveness. The probe, estimates Li, costs less than $1,000 to produce, and he believes that this cost could see a dramatic reduction if it goes into mass production. Camera maker New Electronic Technology (NET) believes single-use endoscopy is the way forward for surgeons and patients, and so has been applying its knowledge to make developments in this field since the creation of the then-milestone quarter-inch CCD image sensor chip-on-tip solution, to fit inside the 6.5mm inner diameter of an endoscope in the 2000s. For this application, ultra-compact camera technology is demanded to minimise health risks and speed-up convalescence, and the company developed a CMOS camera assembly measuring 1.6mm in diameter with integrated fibre optic lighting. 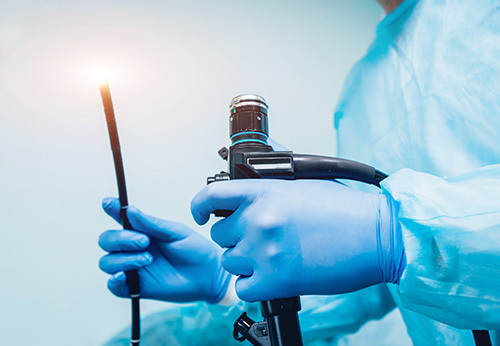 Single-use in this way has the benefit of minimising the infection risks caused by cross-contamination and, Grzegorz Kolodynski, marketing and PR at NET, said ‘the technology could also be applied for the inspection of working channels in multi-use endoscopes’. The camera concept means sensor electronics can be relocated from the tip to the handpiece of medical devices to serve various demands better, he added.